Scottish football could move towards a system where clubs are held responsible for their fans' behaviour, according to the Scottish FA. In 2013 Scottish clubs rejected a move to introduce "strict liability". SFA chief executive Stewart Regan said: "We are just about to start our rules revision process for 2016. I am sure it will be back on the agenda." When the clubs voted against strict liability being introduced, Regan said they felt "it was drafted in such a way as to be too onerous; to move to strict liability from where we are now was quite a leap". Police Scotland is investigating complaints of sectarian singing and anti-social behaviour at Stair Park, where flares were let off. "Uefa uses a system called 'strict liability' to tackle offensive behaviour at matches. Under strict liability rules, a club is responsible for the conduct of its fans regardless of whether the club itself is to blame. Sanctions include warnings, fines, annulment of the result of a match, order that a match be replayed, the closure of sections of grounds, playing matches behind closed doors and the docking of points." 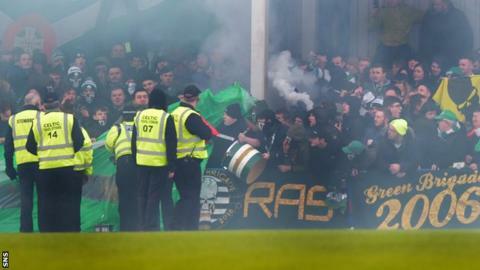 Celtic have banned indefinitely "three individuals connected with the use of pyrotechnics". In addition, the Scottish Professional Football League is to discuss on 19 January sectarian singing by Rangers fans during a Championship game against Hibernian at Ibrox in December. "If there is a willingness or appetite for change then I would like to think we can move that agenda forward," Regan said. "Flares are life-threatening, dangerous and have no place in Scottish football..."
"Clubs need to think hard about whether they want such behaviour taking place in Scottish football grounds. "Flares are life-threatening, dangerous and have no place in Scottish football and anything we can do to stamp them out, I will be very supportive. "There is more of an appetite for more stringent rules because I think there is recognition that we just can't allow such behaviour to continue. "Quite what that looks like and how the rules can be amended will be up to our lawyers to assist us with and our members willingness to change but we will be working on it in the coming weeks." There is the possibility that any new rule passed by 75% of the clubs and brought in by the SFA could apply only to its own competitions, such as the Scottish Cup and Lowland League. Under the SFA's articles of association, the SPFL could opt not to adhere to any new SFA ruling on strict liability. Article 28.10 states: "The provisions of Articles 28.1 to 28.9 (both inclusive) shall not apply in the case of any match played under the jurisdiction of the Scottish Professional Football League, unless the board of directors of the Scottish Professional Football League shall request the Board to invoke the powers granted to it under these Articles." Celtic currently face a Uefa charge after fans set off flares during their Europa League match with Fenerbahce in Turkey in December. Uefa's Control, Ethics and Disciplinary Body will assess the case on 18 February.